10/16 Reagen Sulewski A decent take on the "Heaven & Hell" genre with excellent special effects. 52/60 Les Winan It sure looks cool, but it's a cool looking mess. Something great (or at least better) should have come of this. 74/85 Kim Hollis I let word-of-mouth get my hopes up and was left disappointed. Great concept, mediocre execution. 78/166 David Mumpower I might be the only person in the world who felt Chain Reaction was the superior Rachel Weisz/Keanu Reeves film. 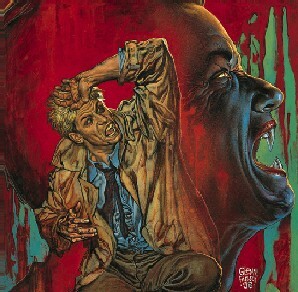 Based on the DC Comics adult-targeted comic book Hellblazer, Constantine represents Keanu Reeves triumph in trying to land a lead role in a comic book movie. Reeves, who is a big fan of comic books and Tolkien, has been rumored to have been interested in playing Wolverine, the mysterious tough guy that was the centerpiece of X-Men, and Aragorn, the mysterious tough guy that is the best part of the Lord of The Rings trilogy. Reeves has settled on starring Constantine, the story of a mysterious tough guy with supernatural powers who investigates strange, and possibly other-worldly, happenings. The project has been in development for a long time and seemed ready to go with Nicolas Cage as the title character and Tarsem Singh as the director. Singh's flair for visually captivating production would have been great for the project, but after he dropped out, Warner Bros. gave the project to another former music video director, Francis Lawrence. Cage later dropped out of the lead role and Reeves pounced on the opportunity. And adding to the list of pretty, pretty people in this cast, Djimon Hounsou is rumored to have signed on to play a retired demon fighter turned occult club owner named "Papa Midnight." Bush front man (the band, not the President) Rossdale is in talks to play Balthazar, a foil for our boy Keanu. Apparently Gavin wasn't about to let wife Gwen Stefani one up him in the acting career department. On a less hunky note, charismatic Next Big Thing Shia LeBeouf has signed to play Chaz, Keanu's scrappy demon fighting teen sidekick. LeBeouf previously played the scrappy dirt bike racing teen sidekick in Charlie's Angels 2 and was also the scrappy teen lead in the Project Greenlight vehicle The Battle of Shaker Heights.